I just added ‘Foosball’ to ‘Sports I Play’ on many of my friends’ profiles. Yes, you read that right. You can now (depending on privacy settings) add interests to your friends profiles (similar to how you can check them in to Facebook Places). I was tempted to add ‘water ballet’ and ‘jazzercise’ to my friends’ profiles, but unfortunately you have to add the sport to your own profile and then only can you add it to others’ profile as a sport you play ‘with’ them. In trying to replicate this it appears it only currently applies to sports. But this is clearly now a trend by Facebook of opening up your profile and activity to input from your social graph. Your friends can now help define you or describe you in a big way. I can see people loving this, but more than likely most will hate the fact that it is ‘opt out’ and not ‘opt in’ by default. P.S: If you want to try this out. 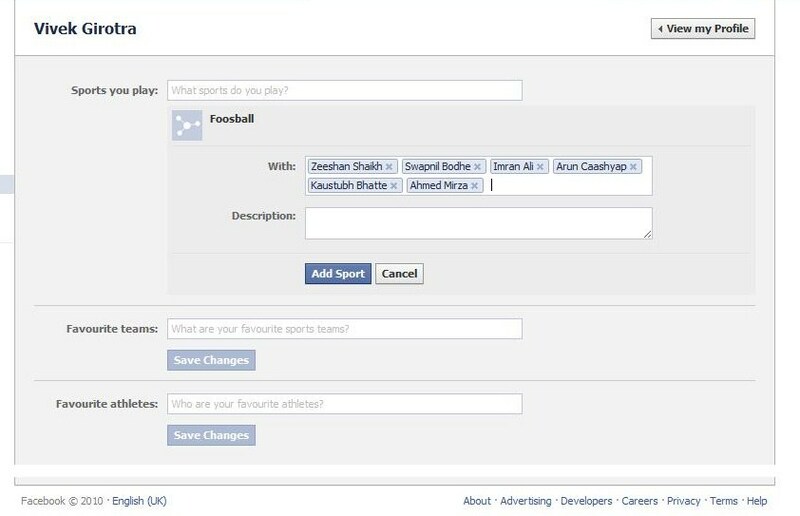 Go to edit your new profile, add a sport, and Facebook will give you an option to add who you play the sport with.